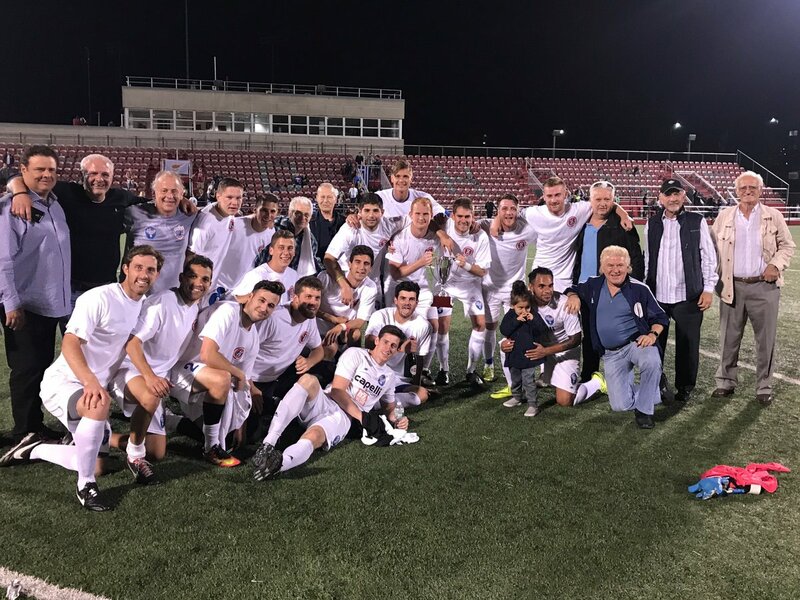 NY Pancyprian Freedoms will host NY Greek Americans in the Greek-Cypriot derby on Sunday at 4:00 p.m. at St. John’s University Belson Stadium in a rematch of last year’s final, which the Greeks won 2-0. “The NY Pancyprians are a great team,” NYGA captain Elliott Firth said in a pre-game interview, “and with them being our rivals it’s a game you have to approach with full focus and provide that little bit extra than most games with added emotions involved. NY Greek Americans players and staff posing for a picture after blanking NY Pancyprian Freedoms 2-0 to win the CSL . NY Greeks is on a 16 league-game unbeaten streak (10 wins-6 ties), which dates back to the second half of last season when they made a late run to the last playoff spot and went on to winning the league. Firth is pleased of the team’s undefeated run that pushed them to the title last year and expressed that he and his teammates rolled their non-losing mentality into this season. “It’s a fantastic achievement,” the Englishman said. “Last season we did the impossible, one of the greatest comebacks in this league's history. That feeling has definitely carried over into this season and we still buzz off that. Despite the Greeks’ unbeaten streak, NY Pancyprian midfielder Luis Estevez is assured that his side will rack a good result against them. The Greeks drew their last game 3-3 with Manhattan Kickers, a match they played without seven of their starters and in which they scored two goals in the last eight minutes to keep their undefeated run alive. “To score two in the final eight minutes just shows the fight not to lose stems deeper than the starting 11,” Firth said, “it’s something that is embedded into this club right now and we are together as one." Despite remaining undefeated, the champions are having a slow start of the season as they sit in seventh place with a 1-0-2 record. The Freedoms also have the same record but are at the upper half of the table in fourth place, owning a better goal difference than their opponents. The Queens-based club won its first league-game of the season last weekend, blanking Central Park Rangers Whites 3-0 at home. NY Pancyprian Freedoms: Left midfielder Andreas Chronis—Chronis leads the team in scoring in all competitions with three goals. NY Greek Americans: Playmaker Stephen Roche—Roche also leads his side in scoring but with two goals. The Irishman converted a 90th minute game-tying penalty kick against Cedar Stars Academy in Week 1 and a game-winning PK against Doxa S.C in Week 2. CSL final: NY Pancyprian Freedoms 0-2 NY Greek Americans at St. John’s University Belson Stadium. 1. NY Greeks’ 2-0 win over the Freedoms in last year's final was their first victory against their rivals in eight games. 2. The Freedoms are the second best offensive team in the first division, scoring 2.6 goals per game. 3. The Greeks have the longest unbeaten domestic run in the top-flight: 16 games (10 wins-6 ties).